Great Laundry Baskets for toys, linens, crafts and sundries. - Suitable size for most situations use, such as closet, table and office for toys, books, CDs, clothes, underwear storage. perfect for transporting groceries, laundry, or household goods. Simply fold up the bins and tuck them away. LIGHTWEIGHT & STURDY - 100% Thick cottons with double liners; Sturdy side handles for easy toting. EASY TO STORE: Laundry Basket can be tucked away in closets, side tables, side washing machine, under beds, left out in the open to enhance decor, or on a shelf. Anyway, it makes the room looks more clean and tidy. 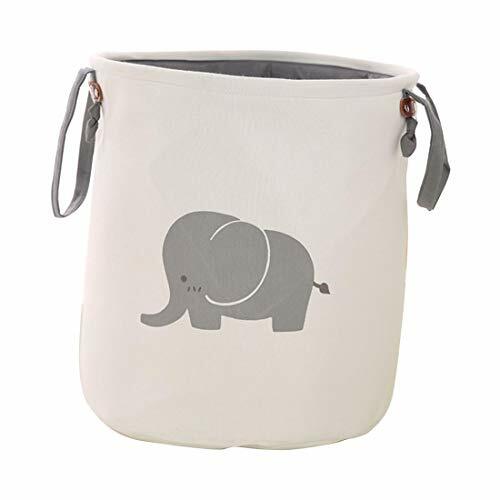 COLLAPSIBLE BIN: Adorable animal pattern designed and easy to take away, you could simply fold them up for space-saving. SIZE: 15.7 inch (height) x 13.7 inch (diameter). Wipe clean only, do not use abrasive cleaner. If you have any questions about this product by HBOS, contact us by completing and submitting the form below. If you are looking for a specif part number, please include it with your message.